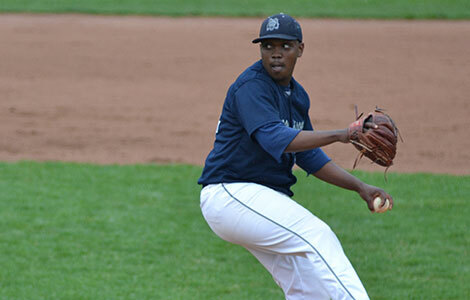 Marcellus Sneed pitches for the Madison College baseball team during a recent home game. With just a May 3 doubleheader remaining on its regular-season schedule, the Madison College baseball team has won 15 straight games, including 10 conference games. In fact, the team hasn’t lost since dropping the second game of a doubleheader on April 12. As a result, the WolfPack baseball team now stands at 34-10 overall and has successfully defended its North Central Community College Conference crown after going 23-1 in conference play. Talk about building momentum for the post-season. Madison College has been a tough team to score on as of late. Heading into the May 3 game, it had posted four-straight shutouts. The WolfPack hasn’t given up more than four runs in a game since a 16-10 slugfest with Harper College on April 18. Tournament play begins this week for Madison College. The NJCAA Region IV Sectional Tournament is scheduled for May 9-10, with the winner advancing to the regional tournament in Schaumberg, Ill., on May 15-17. An RBI single by Brandon Gibis in the bottom of the second inning accounted for the only run in Madison College’s 1-0 win over Kankakee in the first game of a doubleheader on May 2. Gibis had two of Madison College’s three hits in the game and pitched the final out to earn a save. Derick Heffel pitched the win, holding Kankakee to two hits in 6-2/3 innings. Although they gave up six hits, Madison College posted its fourth straight shutout with a 3-0 win over Kankakee in the second game of the doubleheader. Brandon Parr earned the win for the WolfPack, pitching six scoreless innings. Ryne Blanton pitched the final inning without allowing a base runner to earn the save. Madison College was led by Luke Yapp’s two hits and Ryan Makuski’s double. The WolfPack also took advantage of four walks and three errors. Sam Hurt had three hits and three runs batted in to lead a 16-hit effort by Madison College in a 6-0 win over Prairie State College at home on April 29. Hurt drove in one run in the first inning and two runs in the second inning to spot Madison College a 3-0 lead. Gibis, Mike Jordahl, Courtney Watkins and Simon Maurice each had two hits for the WolfPack. Jared Horton pitched the win, giving up just three hits in seven innings. A two-run fourth inning enable Madison College to rally for a 3-2 victory over Rock Valley College in the first game of a doubleheader in Rockford, Ill., on April 28. A double steal by Tony Butler and Brandon Gibis gave the WolfPack a run in the first inning. Then, trailing 2-1, a Sam Hurt single tied the game and a groundout by Travis Hamilton scored the go-ahead run. Hurt and Matt Cole had two hits in the game, while Gibis scored twice. Ryne Blanton pitched the win for the WolfPack, giving up two runs on just three hits in seven innings. A five-run second inning gave Madison College all the runs it would need in a 10-0 victory in the second game of the doubleheader. Cole doubled and Hurt tripled to key the big second inning rally. Cole and Mike Jordahl finished the game with three hits to lead the team.